Welcome back goons to our trip through Super Happy FuntimeOmega Land! This mission will introduce a new mechanic: Com Towers. We've finally made it back to HQ. Is it just me, or is it really cold? It's to be expected--we're near Blue Moon territory. This one just confuses me. Isnt Omega Land far from their home continent? So why is Blue Moon still regulated to cold places? Do they have a big treaty drawn up that cedes places to Blue Moon if snowfall exceeds a certain threshold per year? Do other nations have similar... aaagh. Check out these snowdrifts! I'd kill to have my board right now. I just hope it doesn't bog down my tanks. You do NOT have time for that, Jake! These drifts won't be a problem, though. But if we get caught in a blizzard, it'll be a different story. I bet our units will burn more fuel if they have to plow through snow and ice. 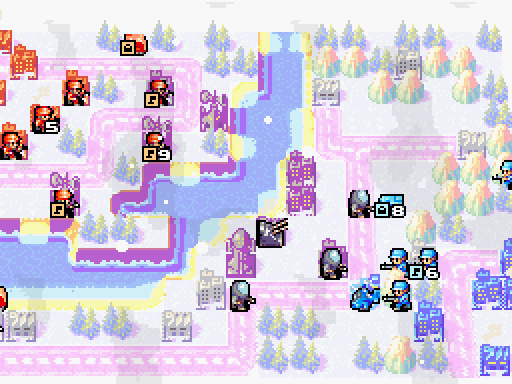 Unless you've been playing with or against Olaf in the War Room, this map also introduces you to snow. 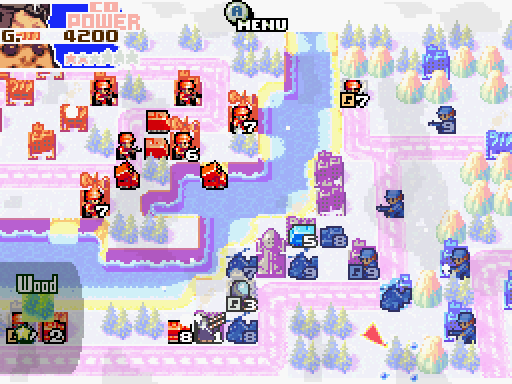 When it's snowing units take 2 units of fuel to move instead of one. 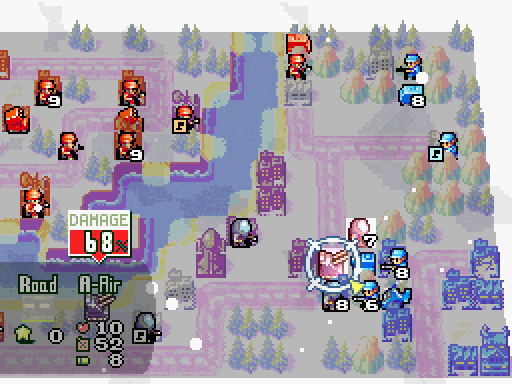 If they really wanted to simulate snow and ice, what theyd do is have a chance (based on your movement type) that youll keep moving and end up a space beyond where you wanted to end your movement. Is the enemy in the vicinity? Yes, ma'am. It appears that their momentum carried them all the way here. I'm getting a coat of ice on my head just standing here! Let's check out the field. Excellent idea. Come on, everyone, it's time we did some reconnaissance work. Hooray! Snow! we can see the three Com Towers on this map, they're the strange buildings that Black Hole owns right now. Honestly, I wouldn't consider this a "oh god oh god bad thing", more of a "less than good thing we'll soon fix". I'll explain why later. What's up with all those wonky buildings down on the shore? Ah, I believe those are com towers. Until now, I'd only read about them... Capture them with foot soldiers to improve communications between your units. The extra chitchat gives them a bit of a firepower boost. So they're Black Hole's now, huh? Let's poach 'em! Yes. And I believe the more com towers you control, the stronger the effect will be. The bonuses you receive don't apply to allied units, though. Don't forget that. So, its literally support bonuses, but only for attack and for everyone. I never did really understand how talking to one another made people more capable killers. Here's the information page for Com Towers. Basically, Com Towers give an army a free 10% attack. Unpleasant, but not exactly killer. This is a two-army map. On the left we've got the team who's job is to steal the Com Towers from Black Hole. On the right we've got the team who's job is to do the rest of the work. This is sort of embarrassing to see this late in the campaign. Either of our armies could engage Black Hole on near-parity from the get-go; with both this mission is basically here, let me tell you about Com Towers okay now go win. Its just a matter of building your favorite units, then advancing over Black Hole. Due to overwhelming votes, we're bringing Sensei. As well as Grimm, Rachel and Colin who were all the runners-up. 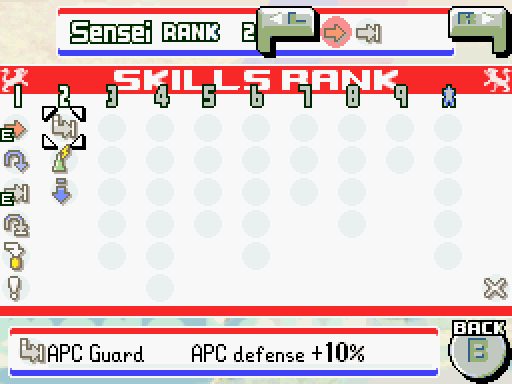 I managed to get Sensei up to level two which means he gets to take two skills with him. Here are the level 2 skills. They're not exactly great, but unlocking them means Sensei does have a second slot to play with now. APC Guard: +10% APC defense, not bad but there's really not a lot of call for APCs on this map as everything is relatively close, otherwise this can be a upgrade for Sensei. 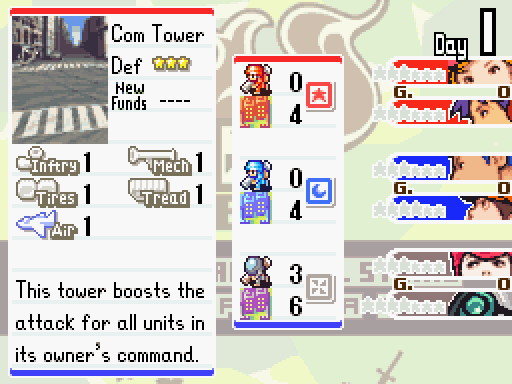 Tower Power: Com Tower effect +5%, would be great except Sensei's on the side that has no com-towers. Sneaky: Dive/Hide fuel cost -1, this is wonderful if you're using Subs or another stealth unit we haven't gained access to yet. Since none of these help wonderfully, Sensei gets +5% direct attack and +8% direct defense. When you have call for it, APC Guard is a favorite of mine. Theyre pretty good blocking units, so its nice to give them an extra little buff for that. Brrr... it's freezing! Let's finish this fast so I can get back to the fire. The enemy has come far. I must protect my homeland... Hang on, friends! Hey, Sensei! Wake up! We're on! 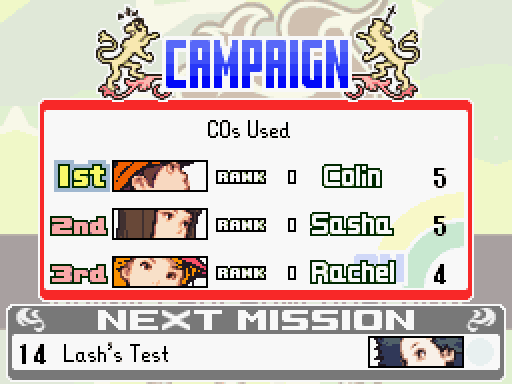 Rachel worked us over earlier, so we've gotta show 'em what we've got this time! Hah ha ha. Yes, we'll manage all right. Let's start by securing these properties around us. Anyways, the first day's just buying infantry, no real need to show that off. Don't you find this cold intolerable, Jugger? It's making my hair frizzy. Jugger has no need of hair. Black bomb lab nearby. Threat of Allied Nations stealing the map: high. I highly doubt they will find it--there are simply too many places to search. It's much more important that we stay warm. Now, come over here, Jugger. Situation: awkward. Initiating subject change. Jugger forecast calls for snow. Snowfall equals high fuel consumption. Must attack today. Attack today. Aha aha ha... Attack before it snows? You're a dutiful one, aren't you? Do you have a space heater in there? Yes? No? Oh, very well, let's go. Aw, Jugger is the gooniest computer. 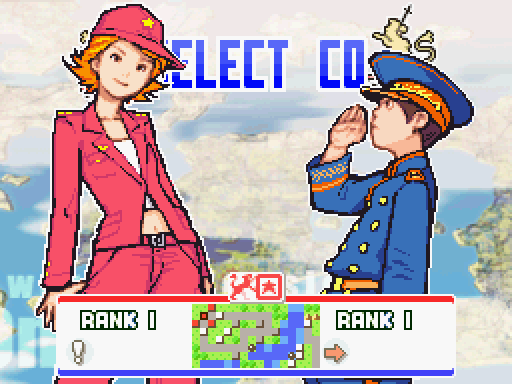 And there's the final two gimmicks for this mission. First of all there's a map to a Black Lab here, second of all it starts to snow on this map and it never stops. The lab is a bit of a chase if you dont already know where to go, but the snow doesnt affect much one way or another. Gotta love how they keep giving us maps where Black Hole doesn't even start with a factory of their own. Shame how it completely removes any difficulty from the game. Oh, and see where the cursor is pointing? That city has the map in it. This could probably be deduced just by looking at the map and asking yourself which cities are the most remote from the action. Otherwise its just keep trying or read a FAQ to find it. Max the weatherman folks! It's hard to see (white circles on a white background) but there are snowflakes falling across the map now. Brrr. This cold is making my old bones cranky. 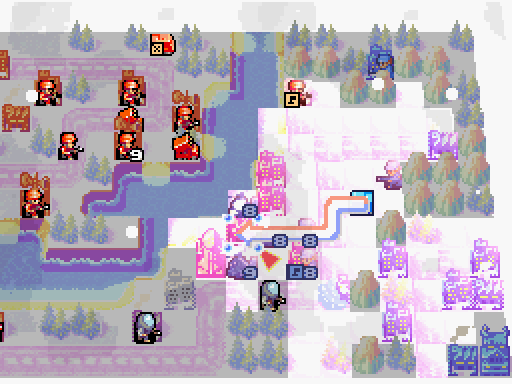 Honestly, this mission is rather easy so I'm cutting out a lot of turns. All Kindle's been able to do so far is replace the 2 infantry she's lost. 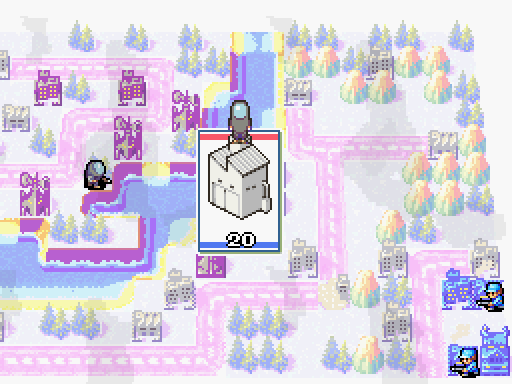 Kindle and Jugger are incredibly gimped in this map as not only do they start without any production but the Com Towers don't actually generate any money. Anyways, Colin and Rachel are taking control of the north bank now that they've crushed the one, single infantry that opposed three factories. I've now got APCs running across to ford the river at the north and west edges of the map. Probably the biggest threat there is in this mission is Kindle firing off an inconvenient power and slowing down your advance by a turn or two. Honestly, she did that and it turned out to be such a non-event I didn't even note it in the update. I'd say the real "biggest threat" is crushing the AI before you grab the map city. 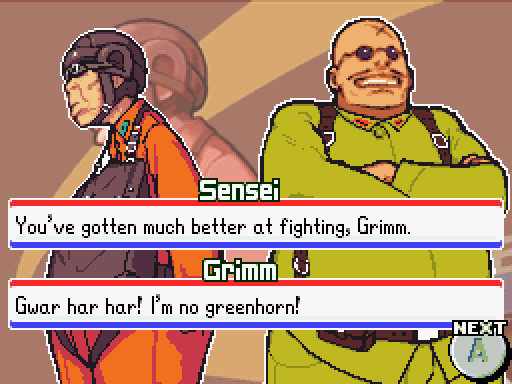 Off to the right Sensei and Grimm own the map's airfield and it's time to crush Black Hole under Sensei's 155% attack Copters. Well, not too fast, gotta capture that city in the top right to get directions of course. Grimm's gonna sit back and eat donuts because I really don't want to bring a guy with only 80% defense to fight the enemy with 130% offense, and unlike in the War Room we don't get any extra experience if we don't bring our full complement. Case in point: you get the only airfield practically handed to you. This ones hard to lose. 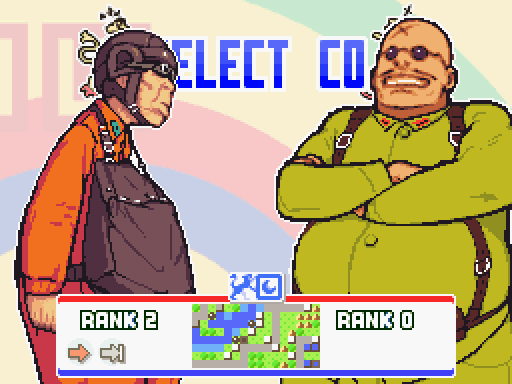 The pair manage to scrounge up enough to build an AA to counter Sensei's Copter. If I'd waited another turn before building Copters they would have built a Md Tank. How do I know this? Because DeSmuMe crashed twice on me after this point so far. DeSmuMe is in league with the AI, you see. They built a poorly-suited unit? Whoops, we crashed! Guess you better try again. We've captured a com tower! Now our troops will hit even harder! Word! Let's go gank the rest of those bad boys! We finally manage to capture our first Com Tower, meaning Black Hole is swinging for only 120% now where as Colin and Rachel are hitting for 105% (Remember, skills!) and 110% each. Anyways, lets build some budget Rockets to pound away at Black Hole's factories with our bonus attack. There's the second com-tower down. 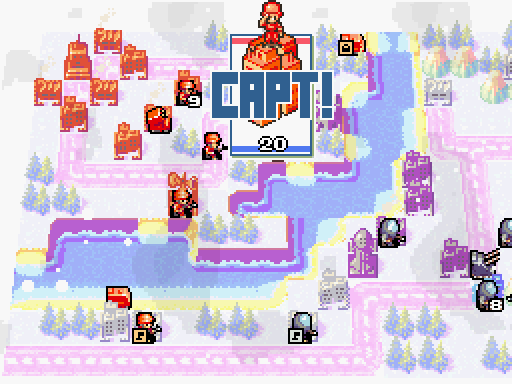 I've always felt the com towers were either a last-minute addition or the designers were a bit lazy about them considering how they don't even have their own little picture for soldiers to jump up and down on. 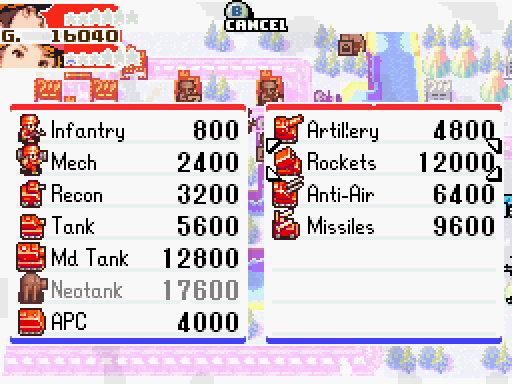 One thing I love about Sensei is how AAs are such an obvious way to counter his infantry and copter spam, and then you find out that he's got 100% tanks that smash AAs into the ground. Or in this case, 105% tanks due to the Bruiser skill. He's only really weak on water. And now we own ALL the com towers. A fact that changes nothing, since theres no airport on the island and Grimm/Sensei are doing 95% of the fighting against Black Hole. What well placed Com towers! 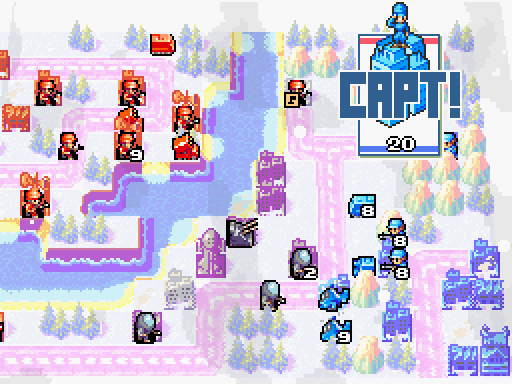 And now we have captured the map city up in the top right. There is nothing left to do besides crush Black Hole. Lady Sasha! We've found a map to a Black Hole research laboratory! Well done. Hmm... It's much closer than I would have expected it to be. Let's transmit this intel to Rachel and have her send out an expeditionary force. One of my favorite ways to shut down a factory is just to park a unit on top of it. A defenseless APC can completely shut down a factory by parking on it. I'm sure everyone can figure out the end result of this. Mainly we never got to use our budget Rockets to lob death across the river. This mission is laughably easy really, it's like IS tossed every single easy level they could have made from other games into this game. Actually, scratch that, we get to use our Rockets a single time. This is where Com Towers do break things, at least a little bit. 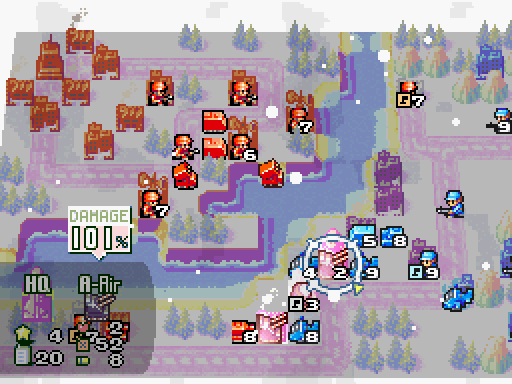 A lot of units do damage such that their targets can survive a hit or two. 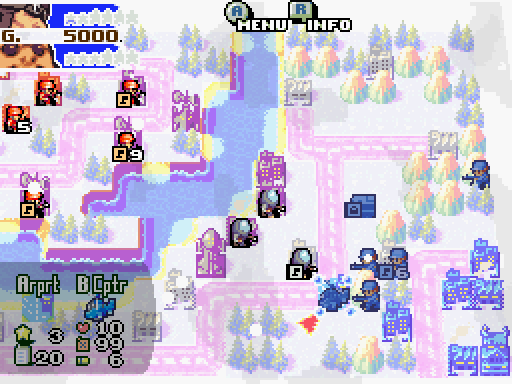 Being able to one-shot enemies you normally shouldnt means you conserve ammo, dont suffer counter attack (in direct damage fights) and can pound your way through roadblocks that you otherwise wouldnt to get at the stuff theyre trying to protect. 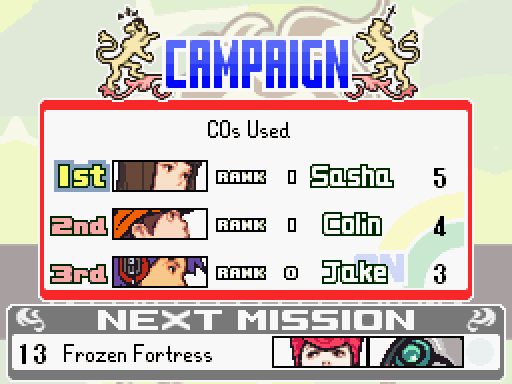 Of course, the Com Tower focused CO breaks the game in an utterly different way. Well see him before too long. You must be joking. Did you actually manage to lose this battle? Jugger, at this rate, your incompetence will get you melted down for shell casings. Jugger...ammo? Battle analysis indicates Kindle lost as well. Kindle also ammo? Don't be so dim. It's time to retreat. You will NOT botch the next fight! Yeah, you better run! What's it like to get served by a com tower?! We've got to grab those whenever and wherever we find them. They own! They own! So hard! Didnt you see how hard they owned when we used it once? Yeah, thats what I thought, bro! Also it wasnt even him who used it. Our strategy was perfect. Now let's head back to HQ. My nose is frozen. 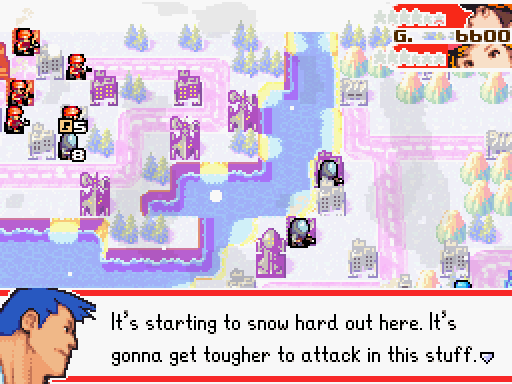 You gonna let a little frostbite stop you, you big lug? I'm still good to go! You've got energy to spare, don't you? I'm glad you're on our side, chrome dome. 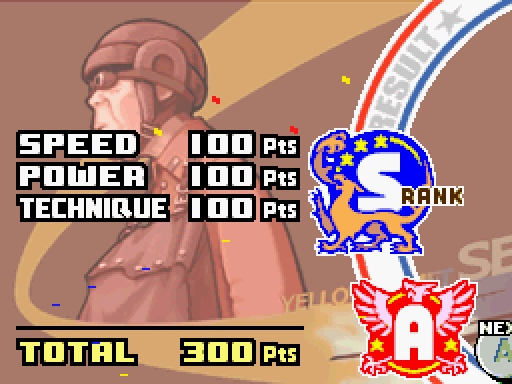 A perfect score for an easy mission. Next time we track Lash down to one of her labs and secure ourselves some Black Bombs...that I'll probably never use. Youre going to fight Lash alone, in a testing facility for Black Bombs. The sheer number of ways this could possibly backfire on you are astounding. This can only end well. Im more impressed with how it starts well, personally.